Learn more about this serious condition characterized by atypical signs, symptoms, and presentations that often hinder proper diagnosis and treatment. Nutrition professionals are perfectly positioned to spot silent celiac disease and prevent the long-term consequences it can cause if left untreated. Moreover, the tests themselves aren’t 100% foolproof. While both tTG and EMA tests are known to have high specificity and sensitivity, they both look for immunoglobulin A (IgA) antibodies. About 2% to 5% of patients with celiac disease have an IgA deficiency, which could account for false-negative reports.3 Brown has seen patients who’d had negative blood tests and negative biopsies but later tested positive. Dietitians and other nutrition professionals are poised to help identify and treat people with silent or atypical celiac disease. “We often have more time with patients than other health care providers, and we might be able to pick up on more information than other providers and put the pieces together,” Brown says. “Have there been stool changes? Do they have a history of nutritional deficiencies or autoimmune disease? What is their family history? Do they have FODMAPs or other food intolerances? Ask very pointed questions. If we listen, we might pick up things that have been overlooked,” she says. Since celiac disease is genetic, looking for familial patterns also can help. RDs should ask whether there’s anyone else in the family who has celiac disease. Are there any unusual autoimmune diseases in the family? In the book Gluten-Free, Hassle Free, Brown created an extensive list of signs, symptoms, and conditions that can be related to celiac disease (see sidebar for an excerpt). If a client has three or more symptoms, she directs them to a gastroenterologist for an evaluation. Brown strongly advises against removing gluten from a client’s diet before some form of testing is performed. “Gluten is difficult to digest, and for some it can be an irritant in a more serious condition. Even if going gluten free makes them feel better, patients should be tested to confirm celiac and rule out other diseases so they don’t delay diagnosis of a serious condition,” she explains. 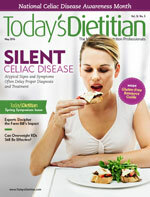 Still, there are special challenges involved in treating silent celiac disease. “If accidently ingesting gluten doesn’t cause someone any noticeable problems, it can be difficult for them to know if they’re eating something with hidden gluten or if their food has been cross-contaminated,” Brown says. Knowing the unusual places where gluten can hide, such as in medications, communion wafers, bouillon cubes, brown rice syrup, imitation crabmeat, and self-basting turkeys, and avoiding these foods is imperative for silent celiac disease patients. Begun recommends that patients join a local celiac disease support group and sometimes introduces them to a gluten-free mentor. “Sometimes meeting another person who has experienced a secondary condition can be an incentive for the person that doesn’t experience symptoms,” she says. However, by watching for patterns and asking the right questions, nutrition professionals can help bring these hidden cases out into the open and make a dramatic difference in the lives and futures of those living with silent celiac disease. — Judith C. Thalheimer, RD, LDN, is a freelance nutrition writer, a community educator, and the principle of JTRD Nutrition Education Services. 1. Waldo RT. Iron-deficiency anemia due to silent celiac sprue. Proc (Bayl Univ Med Cent). 2002;15(1):16-17. 2. Barker JM, Liu E. Celiac disease: pathophysiology, clinical manifestations, and associated autoimmune conditions. Adv Pediatr. 2008;55:349-365. 3. Wakim-Fleming J. Celiac disease and malabsorptive disorders. Cleveland Clinic Center for Continuing Education website. http://www.clevelandclinicmeded.com/medicalpubs/diseasemanagement/gastroenterology/celiac-disease-malabsorptive-disorders. Updated October 2012. Accessed February 27, 2014. 4. Overview of celiac disease. The University of Chicago Celiac Disease Center website. http://www.cureceliacdisease.org/wp-content/uploads/2011/09/CDCFactSheets1_Overview.pdf. Accessed February 24, 2014. 5. Celiac disease. National Digestive Diseases Information Clearinghouse website. http://digestive.niddk.nih.gov/ddiseases/pubs/celiac. Updated January 27, 2012. Accessed February 28, 2014.